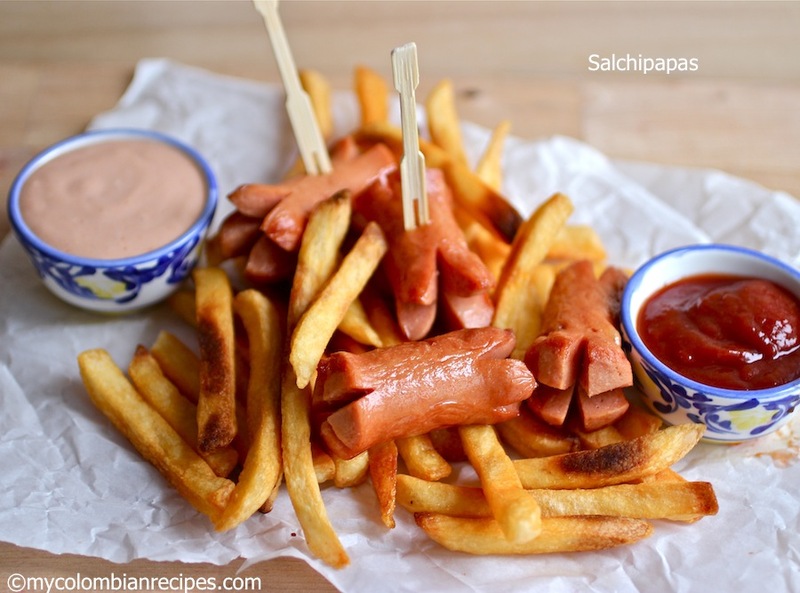 Salchipapas is one of those dishes you are going to find all over Colombia on the kids menu at restaurants. 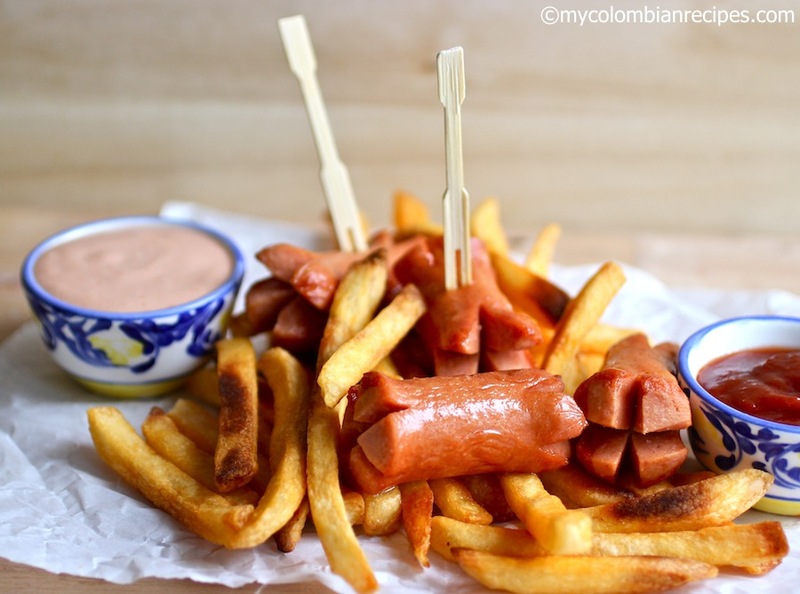 I grew up eating Salchipapas con Salsa Rosada and I still enjoy this traditional Colombian snack. Heat the oil in a large heavy pot over medium high heat. 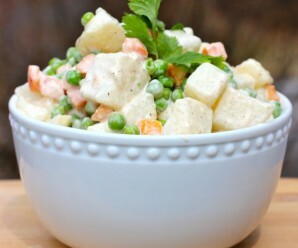 Cut the potatoes into about 1/3 inch thick sticks and place them in a bowl with salted cold water. Drain and pat dry the potatoes and add to the hot oil in batches, turning until cooked and golden, for about 8 minutes. Meanwhile, cut the hotdogs crosswise into 3 pieces each and then cut small, ¼” deep crosses into the tips of those pieces and set aside. With a slotted spoon transfer the fries to a plate lined with paper towels and season with salt. Add the hot dogs to the oil and fry for about 2 minutes. Transfer them to a plate lined with paper towels. 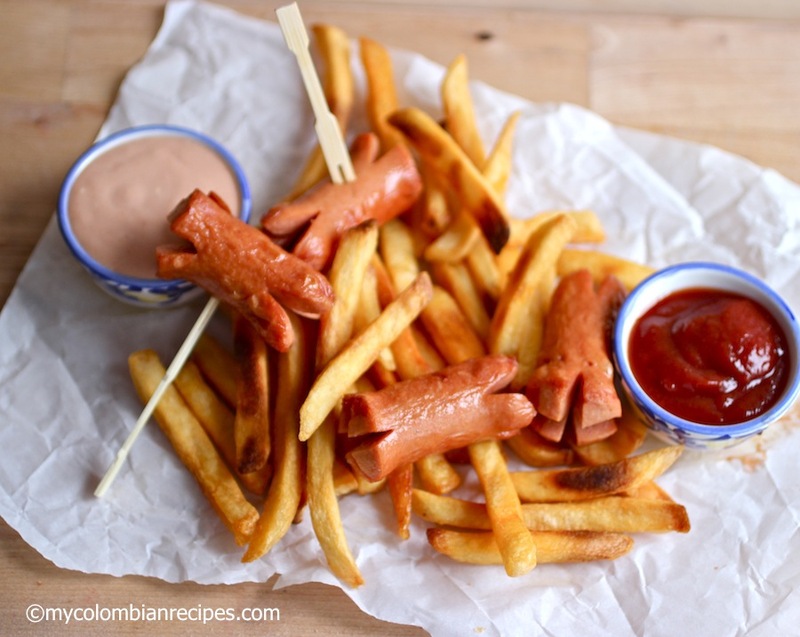 To serve, divide the fries and hotdogs in equal amounts and serve with salsa rosada on the side. You are really kind, thank you so much! It’s spelled “Colombia” and “Colombian” The river and other locations in the US are spelled with a U, the country is spelled with an O. If you’re doing anything regarding Colombia in school you should get this correct. 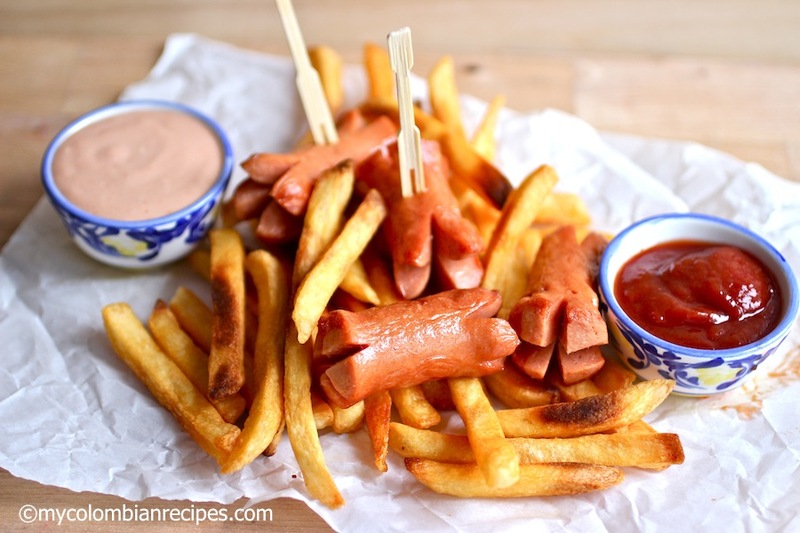 What brand/type of hotdogs (from the United States) are the best to imitate this appetizer? Mil gracias! Que ricura!!! a mi este “mecato” me encanta!! 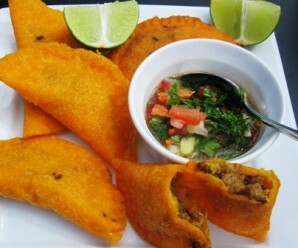 yo le agragaria un par de huevitos de codorniz uuummmm!! Hi, what kind of hot dogs do you recommend? I tried to fry the nitrates free hot dogs that I usually get and It was a mess. 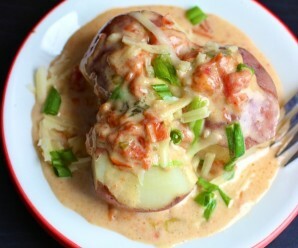 You can also add pineapple topping ummm yummy. The first time I visited Colombia salchipapas absolutely blew. my. mind. I’ve lived in Colombia for almost 8 years now, these are still one of my favorites. Thanks for sharing!